Carefully make a side cut on the anchos and remove the seeds and veins, then rinse them. 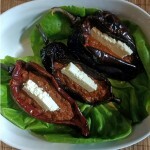 Dip the chiles in boiling water for one minute. Remove them, drain, and reserve them. In a pan, sautée the onion, garlic and serrano. Add the beans and salt. Refry for 3 minutes, then stuff the mixture into the chiles and add the cheese. Heat the stuffed peppers and serve.